Restoration projects always take some time to complete. In a test of patience, this one took more than two years to come back together. But the end result is a beautiful George B. 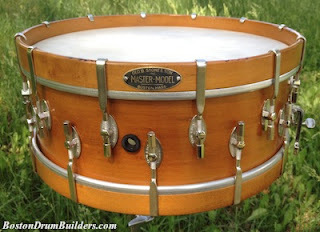 Stone & Son Master-Model drum. 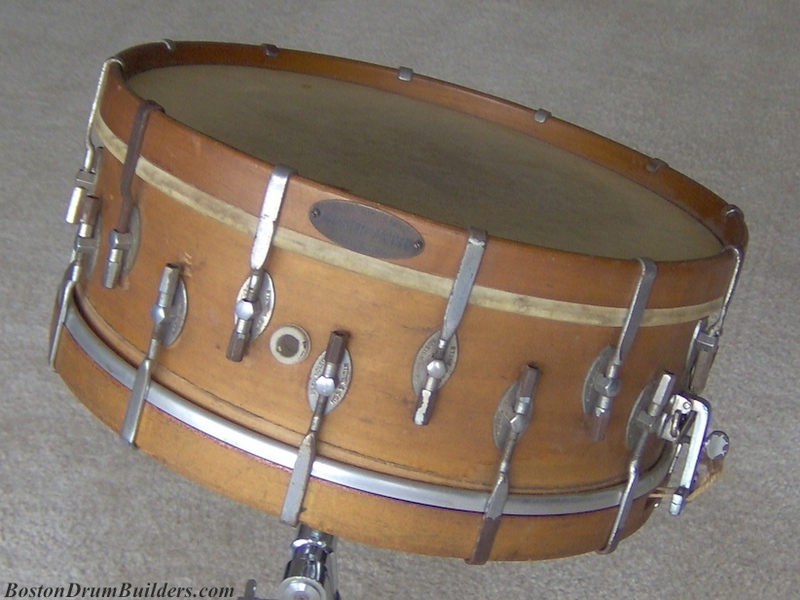 The drum dates from late 1924 or early 1925 based on its four digit Stone serial number. And at age 86, there were a lot of issues with this drum when it arrived in the summer of 2011. The original finish had been removed from the wooden shell and hoops, and a shoddy coat of goop had been applied in its place. 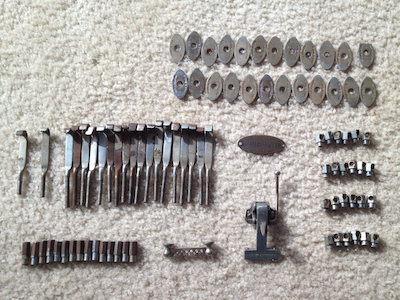 The metal parts were in no better shape. There were several missing claws and nuts, though this isn't too unusual when these drums surface. 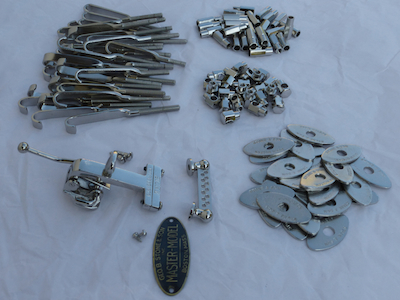 But the remaining hardware had been poorly replated over the existing original nickel plating, most of which was beginning to flake away as rust was starting to take its toll. So the decision was made in the Spring of 2012 to ship this one off to a couple of experts to have them work their magic. 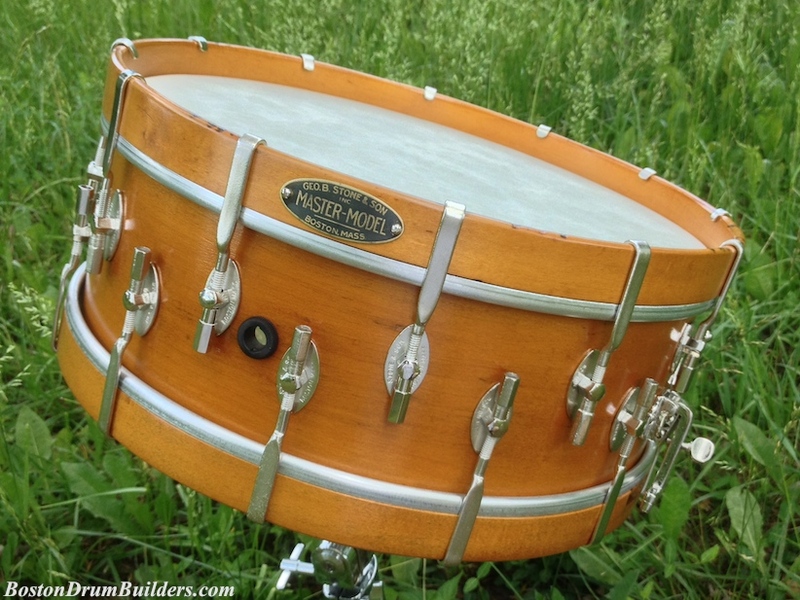 The maple shell and hoops went to Will Tillman of Drummers Dream in Stewartstown, Pennsylvania. Will is a Cabinetmaker who specializes in the restoration and reproduction of period American furniture and he builds drums as a side business. His experience as a woodworker and his knowledge of period finishes and application techniques makes him uniquely qualified to handle a project such as this one. Will was able to remove the unoriginal wood finishes and then apply several coats of natural shellac bringing the drum as close as possible to its original appearance. The metal hardware went to Italian master craftsman Adrian Kirchler. AK's handmade metal shells, formed in the tradition of the early 20th century drum makers, are setting a new industry standard and have been featured on special edition models from Ludwig and Craviotto as well as Adrian's own custom made drums. His work as a craftsman is of the highest caliber and, even as his custom drum business has made it difficult to take on restoration projects, he was willing to tackle this project. Aside from stripping and replating all of the original hardware, Adrian was able to make several reproduction claws and nuts to help complete this drum. 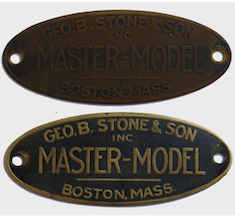 He was also able to re-blacken the background on the Stone Master-Model badge so that the raised lettering could once again be legible. Now that the drum is reassembled, it is a truly striking example of a blond Stone & Son Master-Model. The before and after pictures tell the story best. Do you have a Geo. B. Stone & Son Master-Model? I'd love to hear from you! Send Lee an email at lee@vinson.net.